I have noticed Windows 8 machines seem to be prone to hang at shutdown. While this isn't the case for all Windows 8 systems, its more common then one would think. I believe it more hardware related then software. Simply put a driver or some other piece of software for your motherboard, RAID controller, etc just isn't working right with Hybrid Boot. The good news? Its a very easy fix. So if your Windows 8 PC is hanging on shutdown or just taking forever to turn off, then follow the steps below to disable Hybrid boot. Step 1: Open Control Panel and click on Hardware and Sound. 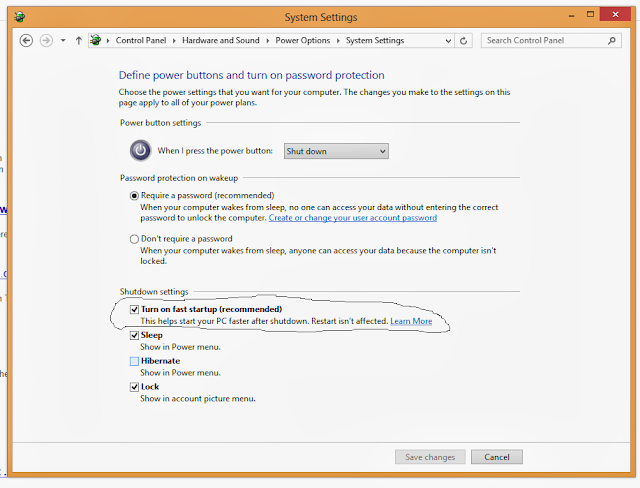 Step 3: Click "Choose what the Power Button Does"
Step 5: Remove the Check box from "Turn On Fast Start Up"
Step 7: In the elevated Command Prompt type powercfg.exe /hibernate off and press enter. If all goes well, you should get a message telling you the process was successful. Step 8: Restart the PC. Thats it! Now your Windows 8 system should not hang on shutdown anymore! If you need to reverse these steps, just follow the instructions below. Step 2: In the Elevated Command Prompt type powercfg.exe /hibernate on and press enter. If all goes well, you should get a message telling you the process was successful. Step 3: Open the Control Panel, then Power Options. Step 4: Click "Choose what the Power Button Does"
Step 6: Remove the Check box from "Turn On Fast Start Up"
Step 7: Restart the PC. Now Hybrid Boot is re-enabled. Disclaimer: I am not responsible for anything that may happen to your PC when changing settings or changing registry values. If you choose to make changes, you do so at your own risk.. You are solely responsible for any damage to your computer , data, or other hardware due to user error, inadequate cooling, too high of voltages, incorrect software settings, and any other factors. Please remember to back up your computer before attempting this. If overclocking, Do not Overclock on the stock AMD or Intel CPU Heatsink and fans. Use Aftermarket cooling heat sinks of sufficient TDP or water cooling to ensure best chance of not having premature hardware failure. As always, remember to backup your data before attempting any change. I am not responsible for data loss or damage of any kind. Is Free-To-Play (F2P) Really Pay-To-Win?